There’s a different way to think about the bailouts, namely that the U.S. government stands at the center of a giant nexus of money raising, most of all to finance the U.S. government budget deficit and keep the whole show up and running. I’ll make a similar but not identical argument. I think the reason why Wall Street is thriving, even today, is that it plays a critical role in financing the trade deficit. Right now the trade deficit is running at an annual rate of $475 billion per year, and rising. It’s up almost 40% over the past year. Virtually all that money has to flow in through Wall Street, directly or indirectly–Treasury bonds, corporate bonds, stocks, financing for consumer purchases. The trade deficit cannot be financed without Wall Street, which has a crucial role as a financial intermediary. That’s not quite the same as saying, as Tyler does, that the financial sector has a key role in financing the budget deficit. During the beginning of the decade, the federal budget was in balance, but the size of the financial sector was growing along with the trade deficit. 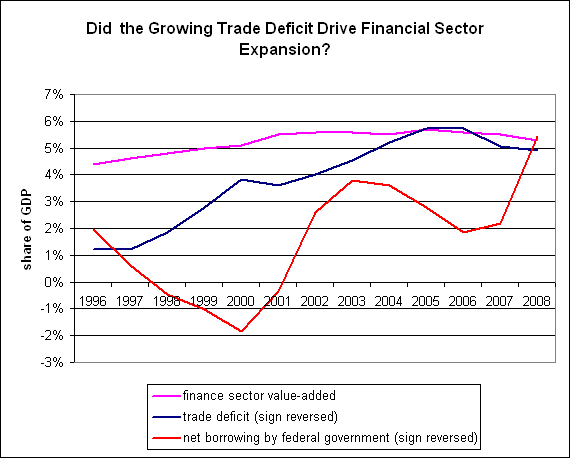 The finance sector steadily grew with the expansion of the trade deficit. The two peaked together around 2005 and 2006. Basically, in my view, Wall Street has been making big profits serving as an intermediary between the U.S. and the rest of the world, sometimes in complicated ways. The big losers in the Goldman Sachs (GS) fraud case were European financial institutions. But remember that 80% of John Paulson’s assets came from foreign investors as well. In essence, Goldman enabled non-US investors to bet against other non-US investors, on the outcome of U.S. borrowing. More generally, the whole subprime debacle was about creating dollar assets that foreign investors, flush with dollars, could invest in. Assuming that I’m right, the Chinese were conservative and smart here–they put their money into Treasuries and agencies, that were fully supported by the U.S. government. The European banks, on the other hand, wanted better returns–they took the trade mammoth surpluses that Europe was running with the U.S. ($700 billion between 2000 and 2008), and poured them back into higher yield but supposedly safe securities. That flow of money fueled Wall Street prosperity. As the trade deficit expands again, the need for savvy financial institutions to connect overseas funders with U.S. borrowers increases. So here’s the hell of it. Wall Street provides a socially useful function, facilitating the flow of money into the country. But it’s not money that’s good for us.